$120.21 in groceries from two separate stores in a Bike Rev trailer. I haven't used this trailer in a while, but since I'm without a cargo bike at present and had to go grocery shopping I thought I'd put it to use. It was a beautiful, albeit chilly day today and there were a lot of people out enjoying the sunshine...fair-weather cyclists are starting to return as well. I always find it interesting the comments I get when I have either a trailer or a Mundo. I think people are sometimes surprised to see such useful bicycles and accessories...and a grown man using it as his main source of transportation. Today was no exception; I received no less than 5 comments and had two full conversations with people as I loaded the trailer in the parking lot of the local Co-op. There's always comments like, "I wish I could do that," or "That is so great, I wish I had the time," and my favorite today was, "My husband would be so jealous if he saw that trailer." Well, people, all I can say is this: just do it...it's not that difficult. On the city streets I pedal almost as fast as the crawling cars and I'd wager to bet that I am having way more fun. 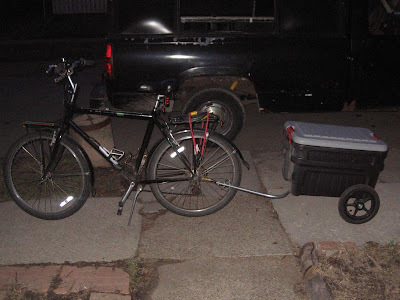 And it's easily apparent when you talk to me (or read this blog) and see the trailer or Mundo that almost anything you carry in your car can be carried on a bike. Just do it. You won't regret it. "I wish I had the time." I don't think I understand that one. Time for what? 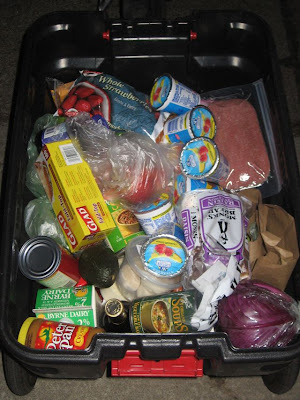 Loading your food into a trailer? Easy, just dump your cart in there, no bags needed. Roll the trailer inside. Time to bike to the store? Chances are high you live no more than 4 miles away - 15 minutes unloaded, 25 minutes loaded. Skip the gym that day.